The weavers of Qom Persian rugs feature high quality silk in their best work which results in the world’s finest Persian rugs. 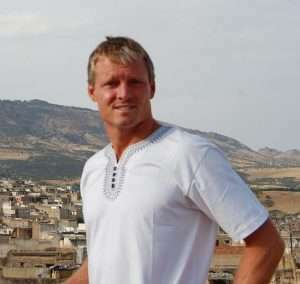 However, the city of Qom has a deep religious significance. Indeed, Qom is held to be the most holy city of Shi’a Islam. This is because it is the location of the Fatima bint Musa shrine. Why is this significant? Fatima bint Musa shrine was built for the sister of Imam Ali ibn Musa Rida. The imam was the eighth Imam of Shi’a Islam and he is a direct descendant of the Prophet Mohamed. As a result, Qom is the center of the world for Shi’a Islam scholarship and it is also a significant pilgrimage destination. Although Qom is one of the most venerable cities of the world for Shi’a Islam, it is a relative newcomer to the Persian rug industry. This is because they only began weaving Qom Persian rugs about 100 years ago. 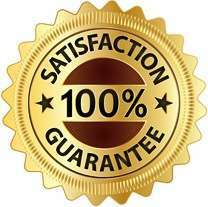 However, Qom quickly gained a world wide reputation for the highest quality silk rugs. Indeed, Qom rugs are considered to be collectors items due to the fine silk material and extremely high knot count. As a result, they are typically quite expensive and are commonly hung on walls to preserve their investment value. One of our must beautiful Qom Persian rugs made of 100% silk. Additionally, it boasts an extremely fine knot count of about 1000-1100 knots per square inch and features the central medallion design. Rich ivory background in the interior framed with a frieze highlighted in rich deep reds. 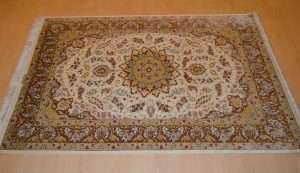 Qom Persian rugs include the floral, medallion and tree of life designs. Additionally, common colors include blue, red and ivory. We are very pleased to have several world class antique Qom Persian rugs in our collection. As a result, we can display new and also antique 100 year old rugs that were some of the first ever created in Qom. 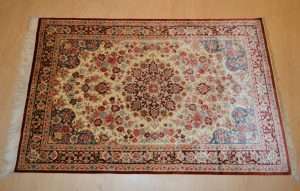 Unique antique Qom Persian rug 90 years old. 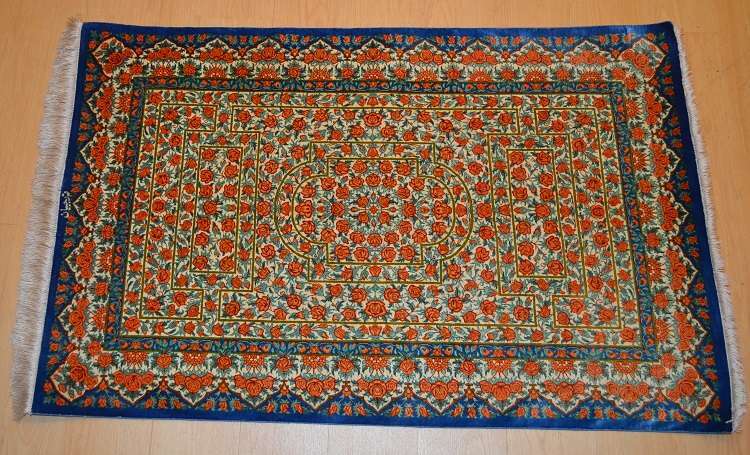 The rug features a repetitive floral pattern with super fine knot count of 1100 per square inch. It is from the original Qom collection. One of the unique attributes of Qom rugs is that their weavers sign the rug on the top. This is in contrast to Tabriz and Isfahan where they sign on the bottom. However, the signature is weaved into the rug and it is not written. Additionally, the “top” of the rug means it is the starting point and it is signed before the work is finished. This fine Qom Persian rug features a rich ivory background in the interior surrounded by deep rich reds. Additionally, the fine carpet is 100% silk and features a super fine 1050-1100 knots per square inch with a prevailing floral design.